Coffee made with the pour-over technique consistently produces brighter, more flavorful coffee than you can get from a regular drip coffee machine. The technique isn’t quite as easy as it sounds, however, and you need to be patient while preparing a cup and you can only brew one cup at a time. It’s great when you have a few minutes to spare, but there are times when you just need to be a little bit more efficient – like those times when you are trying to prepare coffee or two or three guests at once. 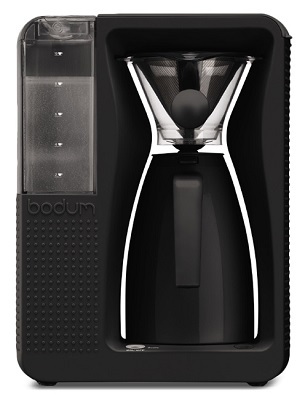 Bodum b.Over Coffee Brewer is a stylish new coffee maker from Bodum that is designed to deliver high quality, pour-over coffee in quantities up to 40-oz. The coffee maker automates the pour-over process using a unique shower-head design that evenly distributes hot water over the grounds in the filter portion of the machine. The coffee brews and drips down into a vacuum-sealed, vacuum-sealed, double-walled carafe that will keep your flavorful coffee hot and aromatic for hours without requiring any reheating. For me, being able to brew great coffee in larger quantities is a huge time saver for days when I’m rushing around from project to project.